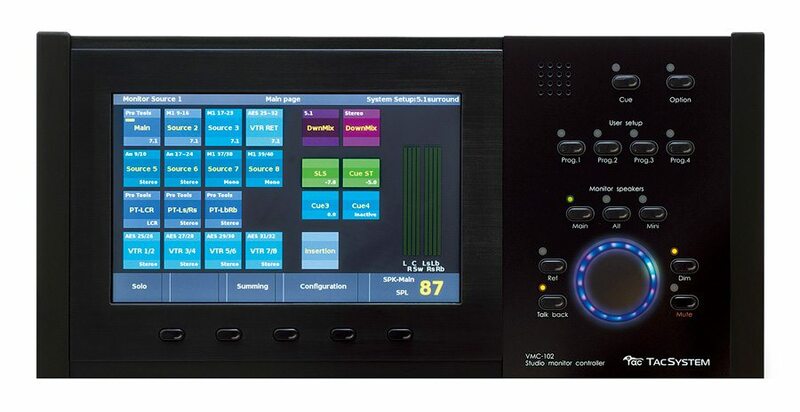 Advanced audio monitoring system with touchscreen control, for mixing up to 128 inputs onto 32 mix buses. Ideal for multi-stem monitoring and immersive audio creation with – among others – Pro Tools or Avid systems; caters for all current and projected surround formats. Full integration with DirectOut ANDIAMO MADI interfaces. Push-buttons for primary monitor functions: Dim, Mute, Talkback, Speaker select, etc. The VMC-102 is designed to work in tandem with a bidirectional MADI interface such as the DirectOut ANDIAMO Series. 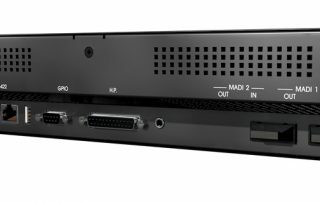 Several ANDIAMO models are available to convert between MADI and up to 64 channels of analogue and/or AES3 digital audio. See DirectOut ANDIAMO.2, ANDIAMO 2.DA, ANDIAMO 2.AD, ANDIAMO.AES and ANDIAMO 2.XT. 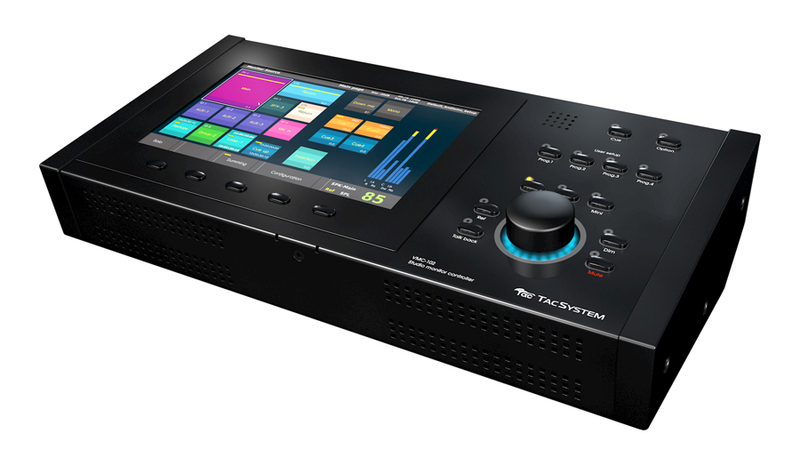 The TAC System VMC-102 is a studio monitoring controller intended for use in film and broadcast sound mixing, immersive audio creation and post-production work in studios using systems such as Pro Tools, Avid or Pyramix. It has particular application to Object Audio, where stem metadata is transmitted within a stereo mix allowing the recipient to determine the specific content, such as language selection, and to formulate the audio format that best suits their taste or audio system configuration. The VMC-102’s native audio I/O format is 64-channel MADI and therefore it can connect directly to MADI equipped workstations or consoles. Two MADI I/O ports (SC optical) are provided, allowing for 128 input channels and 128 output channels. Systems with analogue or AES I/O can be connected via appropriate MADI converters such as the ANDIAMO range from DirectOut as recommended by Tac System. The VMC-102’s directly controls the DirectOut ANDIAMO, allowing setup and control of the routing matrix and other unit parameters within the external interface, either via the MADI connection, or by using a separate Ethernet connection and an Ethernet-to-USB converter. Other suitable interfaces include the NTP PENTA and DAD (Digital Audio Denmark) AX-32, which receive their configuration data from the VMC-102 via Ethernet. The VMC-102 offers maximum flexibility in I/O assignment and is ideal for use in facilities where multiple stems for dialogue, music, atmos, effects, etc. are used. Input channels may be freely assigned to be part of any stem, the number (and naming) of stems is user-definable, and each stem can be of any “width“ (e.g., stereo, 5.1, 7.1). As there is no restriction on input assignment, the VMC-102 is compatible with all current and planned surround sound formats. On the output side, the 32 monitor mix buses can be similarly mapped onto any number of destinations and/or MADI output channels: output assignments could include multiple sets of monitor loudspeakers, again in any stereo, surround or immersive configuration, plus auxiliary sends, cue sends and talkback. Power amplifiers, cue systems, etc. are then connected to the outputs of the MADI interface as required. Once an input/output configuration has been defined in this way, it can then be saved for subsequent recall. The controller itself is a compact, elegant free-standing unit with all the primary monitoring functions – level, mute, dim, speaker selection, talkback, etc. – selected or adjusted by physical controls. The large main level control may be freely assigned to any or all the mix buses and/or output channels as necessary; additionally, each output has its own output level trim adjustment. The main control has a multi-colour LED ring which changes colour to indicate dim and mute modes: dim level is user-definable. The controller uses a colour touchscreen display for all other system access. The main software design consideration has been to minimise the amount of screen access required once the configuration for the job has been set up. In general, the physical controls plus the main page will suffice for most operational actions. The main page carries a set of buttons which enable each pre-defined stem to be selected for monitoring, together with cue, downmix and mono mode selection. Stem selection is additive, so individual components of the total mix can be worked on in isolation. A comprehensive set of solo functions is available on a separate page. A downmix function, whose width and channel parameters are user-definable, is available at any time to check compatibility with other surround formats or stereo. A dedicated mono function allows mono compatibility to be checked. Additional functions such as individual level trims and delays for each speaker set are available through further configuration pages. 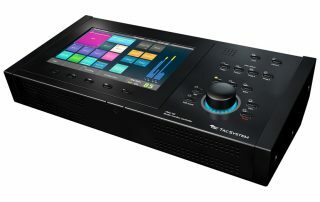 An alternative physical version of the controller is available for direct integration into an Avid S6 control surface.